Alex Lloyd Gross photo- Patrick Simmons of the Doobies live in Camden July of 2017. 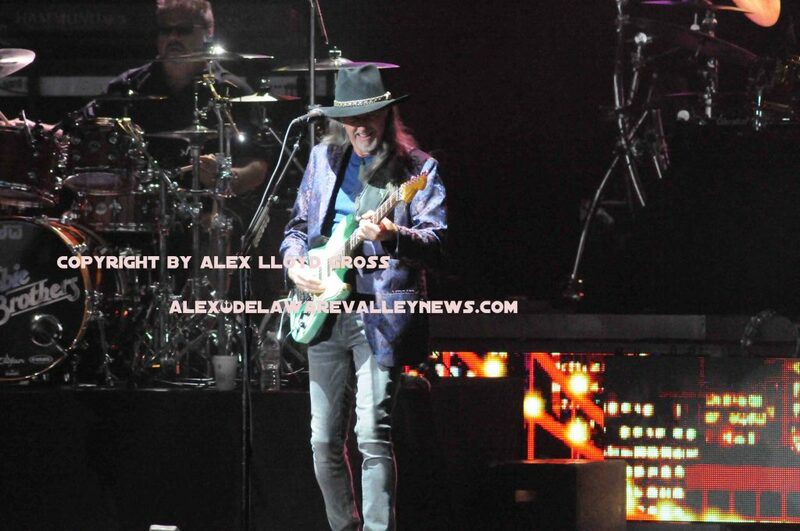 The Doobie Brothers are going to be in Camden tonight, July 11, 2018 at the Amphitheater on the water . They will be playing with Steely Dan. You can expect most of the classic hits to be played but in the near future, you can also expect to hear some new music from them as well. “We’re working on some new stuff right now. , we’re kinda just chipping away at it right now. Some songs are there and others need work,”. Simmons said. The record will hopefully be released around the winter of 2019. When they come back to play future shows, they will play tracks from it. Songs like ” (getting) Used to Changes. I had another song I’m working on called “Little One” which is about the immigrants, about the children being taken from the immigrants and put in cages. When Simmons plays live, he prefers to play smaller venues for the better acoustics. However smaller venues cannot match the crowd response of a place like Camden. “The energy is four times as much as that of a smaller hall”. For a lot of the shows the Doobies have done recently, they have played with bands who have fans that are also fans of the Doobies. . Steely Dan has had band members who played in the Doobies. Michael McDonald, Jeff “Skunk” Baxter just to name couple right off the bat. Concerts today are vastly different than in the 1970,s during the heyday of this band. Ticket prices were more reasonable, tickets were $8.50 . Taping shows was forbidden. In fact, the band was on the television show”What’s Happening”. They came head to head with Al Dunbar, a fictional bootlegger that got busted getting kids to tape a Doobie Brothers concert. Dunbar was played by the late Theodore Wilson . “Some of the band members did not want to do the show, but I loved that show, I just did not know how we were going to fit into it.” Simmons said. He still has his script from the show. When asked his opinion on bootlegging, he replied, “People bring their phones to the show, it doesn’t really sound great, but we put a good show every night so I’m not embarrassed to have it, I don’t care one way or another”. If you go tonight, bring your phone. Show starts at 7:00 PM. Some seats still available at the door..